THE ARMY BOMB Disposal robot was used to investigate a suspect item outside the walls of the Cathal Brugha Barracks in Rathmines but the item was declared a hoax. The army experts arrived shortly after 6 am this morning. Local residents were not evacuated but some were informed by a phonecall from gardaí that the operation was taking place. One resident near the barracks gate at the Grosvenor Lodge said they saw a flower pot beside the gated entrance. They were told by gardaí to stay at the back of the house until the all clear was given. A spokesperson for the Defence Forces says the item was checked remotely using the bomb disposal robot but was quickly deemed not to be an explosive. It was was then handed over to gardaí who remained at the scene. 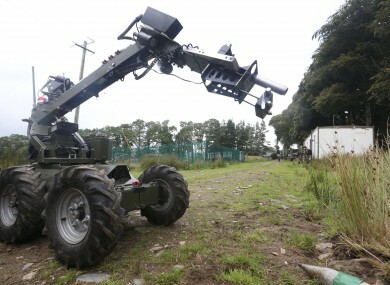 Email “Army bomb robot examines suspect ‘flower pot’ outside Dublin barracks”. Feedback on “Army bomb robot examines suspect ‘flower pot’ outside Dublin barracks”.